NICK’S Window Cleaning is an established cleaning company which also specializes in eavestrough repair services. We make your rain gutters work perfectly at their full capacity. Our services range from cleaning of clogged gutters to all kinds of repairs. We have earned the status of most trusted eavestrough repair company in Markham through the tireless efforts of our professionals. Every member of our team is highly experienced and has gone through rigorous training to deliver the best service at your doorstep. Our employees enjoy WSIB coverage and we have secured our framework by full liability insurance. Rain gutters may fail in a variety of ways depending on the cause of failure. Improper installation or poor-quality materials is the leading cause of generating many problems in gutter system. Each problem ultimately leads to seam failure resulting in leakage of water from joints or seams. Seam failure occurs when the sealant which holds the joints, deteriorates or breaks away. Seam repair is the best method to resolve many gutter related problems. It ends the leakage once and for all. Seam repair is done by mending the seam joints of respective gutter sections. Our experts specialize in seam reparation and restoration to its original condition. Rain gutters require regular inspection and maintenance to work at their full capacity. Unfortunately, many people do not pay attention to small issues in their gutter systems unless they turn into huge unavoidable and costlier problems. Regular cleaning of gutters is necessary especially for regions like Markham where it rains and snows more frequently. Gutters are usually clogged due to debris or fallen leaves in autumn. When water accumulates in these clogged gutters, sagging occurs and joints or seams fail. These minor problems should be dealt with in their early stages. To avoid these problems, we advise you to get your gutters checked after every six months. Eavestroughs of large facilities like large residential and commercial properties carry more weight than ordinary gutters. They are more susceptible to fail in extreme conditions. To perform efficiently, they need more repeated inspection than the normal gutters. Debris or trash can accumulate easily in them and may create a lot of problems like clogging, sagging, leaking etc. We proudly present our services for gutter systems of such large facilities in Markham. Our experts are highly experienced in dealing with all sorts of problems in the eavestroughs of your residential or commercial buildings. We have been offering our services to the citizens of Markham for more than a decade. Our service is highly affordable and we complete all work in the shortest of time possible. Our skilled team is experienced and professional. We treat our valuable customers and their properties with utmost respect. We work hard to achieve customer satisfaction and build a long-term working relation with our customers. We are the most trusted gutter repair company in Markham. We provide a no-obligation free estimate of the work to be done. 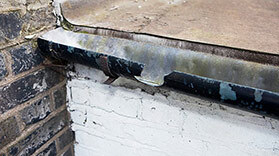 Gutter or downspout is an important part of every building which should not be left as it is. Without adequate maintenance and regular inspection, many problems like water damage and moisture accumulation may arise in your buildings. That is why you should get your gutters checked at least twice a year. Many people avoid regular inspection and maintenance of gutters. Some people want to repair small issues in their gutters by themselves. Acting on your own may create more problems for you. So, if you desire to save some real cash then hire some expert for this work rather than repairing it yourself. 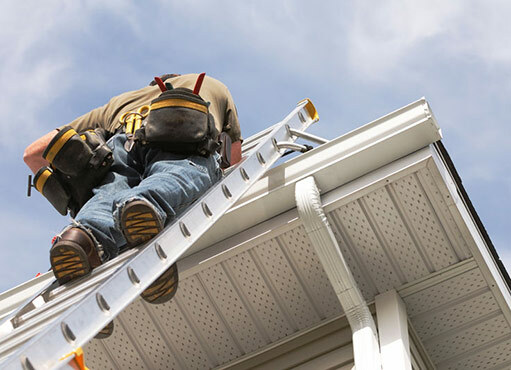 Climbing ladders to repair gutters by yourself may seem a thrilling adventure to most people. Many people would not want anyone to do anything with their valuable property. Still, we advise you to never repair your eavestrough on your own because you neither have the right tools nor the right knowledge needed for this process. You may end up damaging your property or getting serious injuries by acting on your own. At NICK’S Window Cleaning, we provide all sorts of gutter repair and cleaning services. Our experts work at the best of their capabilities. We offer various services, whether it is a clogged gutter or leaking downspout, broken ferrule or soffit, we do everything. We have providing our services to the people of Markham for a long time. We have the best team, the latest tools and a lot of experience. We leave no mess behind after the repair work. We have the most affordable rates in town. We restore your gutters to the original condition. We give the best results!